AP EAMCET Final Seat Allotment Results 2018: Andhra Pradesh EAMCET 3rd phase allotment results college wise are released at apeamcet.nic.in. Candidates can download AP Eamcet Final Phase allotment order 2018 from official website. AP EAMCET Seat Allotment Order: At last AP EAMCET board reveal the date of ap eamcet seat allotment results at apeamcet.nic.in. From June onwards ap eamcet board want to conduct first phase counselling. They will verification certificates and you can choose options after completion of verification, AP eamcet 2018 allotment order download at apeamcet.nic.in. Andhra Pradesh EAMCET 2018 Final phase counselling seat’s allotment going to announce on 31-07-2018. The students who are participated in the 1st phase counselling download your allotment order at Eamcet official web portal. In Final phase eamcet counselling approximately 60,000 students are registered their web options. AP EAMCET board are announced seat allotment Details. The provisional allotment of seats is made on 31-07-2018 and placed in the website https://apeamcet.nic.in. 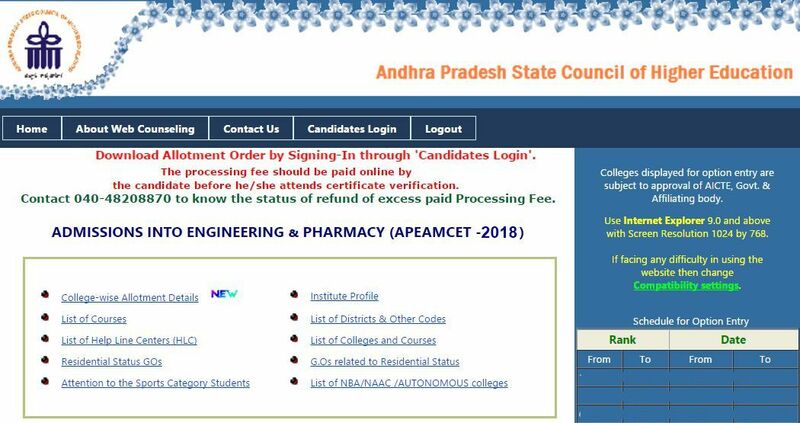 For downloading the candidate’s provisional allotment order, enter the AP EAMCET Hall Ticket Number, Password and Date of Birth in Candidate login in https://apeamcet.nic.in. Allotments now made are subject to the grant of affiliation from the University. 3. Enter your Registration Number, date of birth, hall ticket number & password. 4. when login into your account click on the download allotment order button. Sir I change my college how? There is no any option .please give me one option I change college .third counciling is over . I didn't get any seat in 2nd councillor of APEAMCET. When I wanted to enter options are not there in one college but seat allotment is over and I found even weaker ranked students are allotted seat in that college. How was it possible? No msg also what can I do now???? what is the reason for that ……..??? after obtaining the seat on 2nd counselling, the previous seat in 1st counselling will be available or not.i did self report to the college which i was alloted in 1st counselling.so please tell me.the previous seat is available or not?? i JULY 7, 2018 AT 7:17 PM I didn't get a message from the board of ap eamcet of 2counselling…. Plz help me…. What is the reason behind it..? in the allotment sheet it is provided that under OC_PHO_GIRLS_SVU category. What does this mean? I didn't get a message from the board of ap eamcet of 2counselling…. Plz help me…. What is the reason behind it..?